There were 72 competitors at the Saxton Stadium (Stoke) in Nelson for the South Island Open earlier in August. There were 12 tables (where normally there were 8) to meet TTNZ requirements. This meant that the playing area (per table) was smaller than usual, which made defensive play difficult. Later in the day the playing area was widened for finals. Results are on the TTNZ website (with photos here) or from Table Tennis Nelson with the results document posted here. Much thanks to Donny Harris and Paul Op Den Buysch for all their long hours of work in collating the entries and entering them on the computer. Also to the volunteers (Alan Cuthbert, Graeme Mathieson, David Watson and Malcolm Wong) who set up the playing area on the Friday before the tournament. Considerable time was required as the Table Tennis Nelson Butterfly Tables were taken down, the playing area cleaned and the Stag Tables set up. There is a significant cost to Table Tennis Nelson in using the Stag Tables as they had to pay the freight cost for transporting them to the venue and then returning them to Table Tennis NZ. Thanks to the tournament organisers for all their hard work in making this a well run tournament. Joachim Kusche (Referee), Henry Redmond (Tournament Manager), Donny Harris and Paul Op den Boysch (Tournament Controllers), and Kay Hazeldine (TTN Secretary). Great scheduling meant play finished at 6.00 pm (Sat) and 5.00pm (Sun). The cafeteria was well run by Karen Holmes and her team ( Nolene Wells and her daughter Katherine, Don and Audrey Harris, and Dianne Watson). Stephen Hirst won the Open Men’s Doubles with Callum Rusbridge, and the Over 30 Men’s Doubles with Heath Murdoch. Callum Rusbridge and Heath Murdoch won the B Grade Men’s Doubles. Heath Murdoch was runner up in the Over 30 Men’s Singles and won the Over 40 Mixed Doubles with Donna Madden (Nelson). 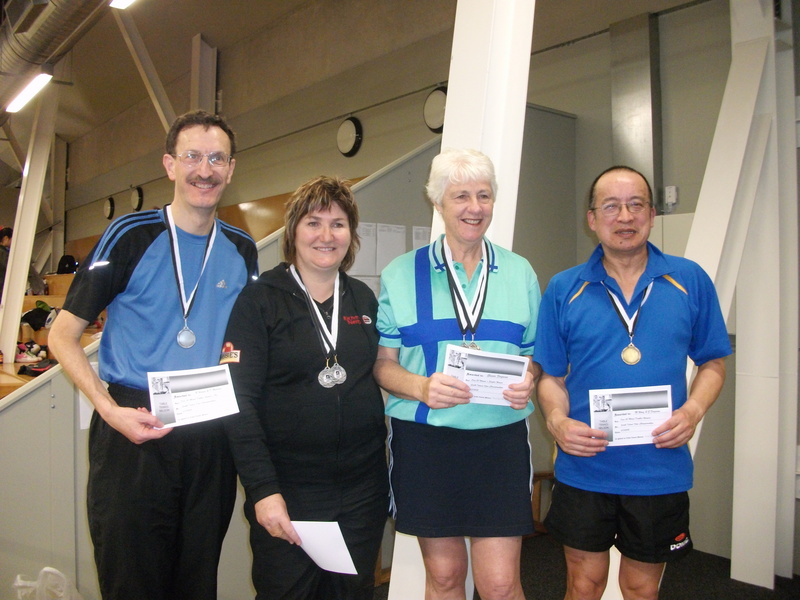 Malcolm Wong won the Over 50 Mixed Doubles with Glenda Ferguson (Nelson) and was runner up in the Over 50 Men’s Doubles with Mark Nalder (Nelson) and C Grade Men’s Doubles with Steve Bellamy (Nelson).